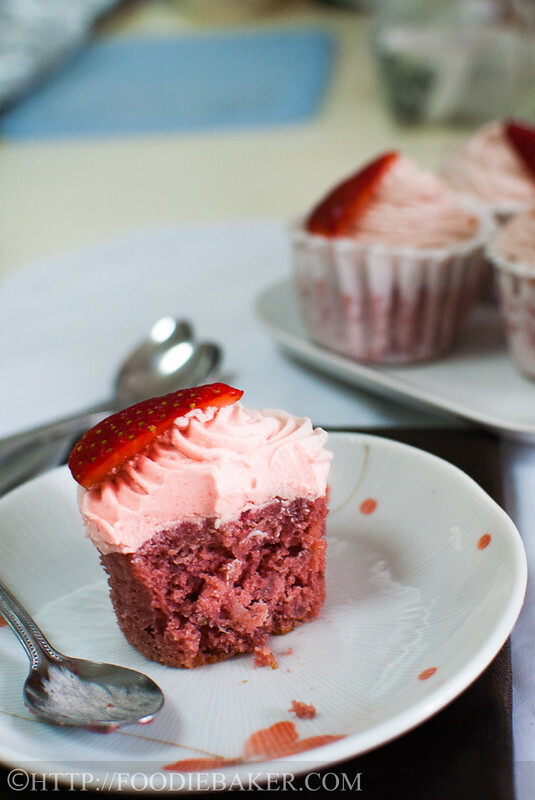 I re-baked a previous favourite of mine – Strawberry Cupcakes as I had leftover Korean strawberries that were on the verge of growing mould (yikes I know!) and I felt that these cupcakes deserved a lot more attention. 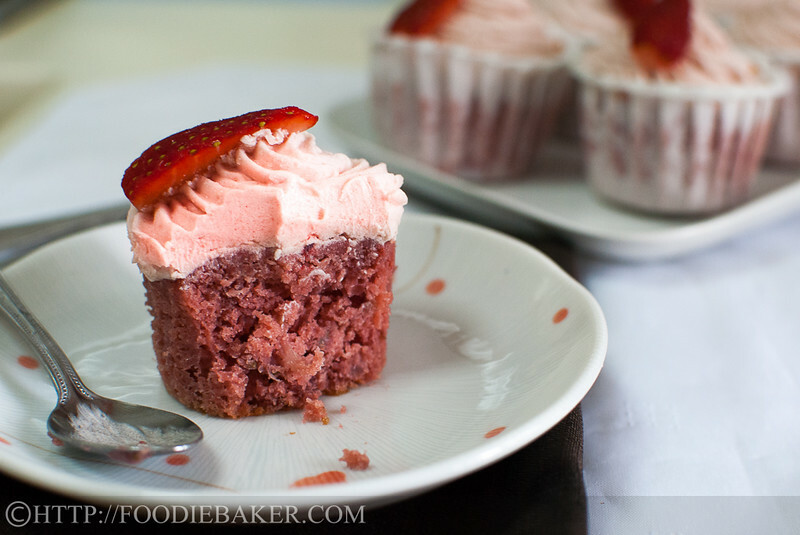 What I love about these cupcakes is that the cake portion is made using real strawberries. If you Google “strawberry cake”, most recipes that claimed are “Strawberry Cakes” are made with white cake box mix and strawberry jello – and that’s definitely not the strawberry cake that I’m looking for. So when I found this one, I knew it’s a keeper, and I highly recommend it to be yours too! For the frosting, strawberry cream cheese frosting would have worked very well but I decided to try out the dried strawberry powder that I’ve acquired during my trip in Taiwan last year. I’ve originally bought them to bake strawberry macarons but I don’t have the motivation to bake macarons… yet. :p I’ve included both versions of frosting at the end, so use whichever one you like! 1) Cream butter and sugar together until light and fluffy. 2) Beat in the egg. 3) Beat in the milk / buttermilk / yogurt. 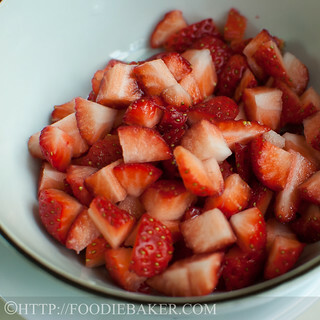 4) Chop up some strawberries! 5) Add them into the batter. 6) Sift and fold in the flour. 7) I added a little red food colouring to intensify the colour. 8) Bake away and then frost! 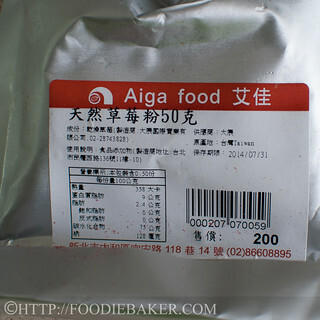 This is the strawberry powder that I used for the frosting – I’ve gotten it from Taiwan! It’s dried strawberries processed into a fine powder. 50 grams of this intense powder cost NT$200 (US$6.78). They also sell other quality powders such as matcha, lemon, pumpkin (have yet to try this). They stock up a lot of hard-to-find ingredients such as special flours for making bread (those really expensive Japanese / French flours), and are also well equipped with baking equipments. Do head over there and check it out if you have a chance! Edit 12 May 2013: I’ve tried searching for strawberry powder here in Singapore, but to no avail. Sunlik stocks up strawberry paste, which the owner was really nice and let me have a whiff of it, but unfortunately the smell is no where near real strawberries. I’ve found a recipe on making strawberry powder from scratch, I’ll give it a try when I ran out of mine, but meanwhile if you’re interested, do head here to read more! I’m submitting this to Bake Along hosted by these 3 awesome ladies: Lena (Her Frozen Wings), Joyce (Kitchen Flavours) and Zoe (Bake for Happy Kids). Do click on the froggie above to see what other celebratory cupcakes other fellow foodies have came up with! Happy 2nd birthday to Bake-Along! Preheat the oven to 175 degrees Celsius. Line 12 6 cupcake moulds with cupcake liners. Set aside. Combine the flour, baking soda and baking powder in a small bowl and set aside. 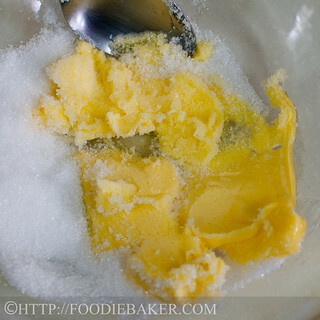 Place the unsalted butter and sugar in a large mixing bowl. Using an electric mixer, beat on high speed until the mixture is light and fluffy, about 5 minutes. Add in the egg and vanilla extract and beat on medium speed for 1 minute until incorporated. 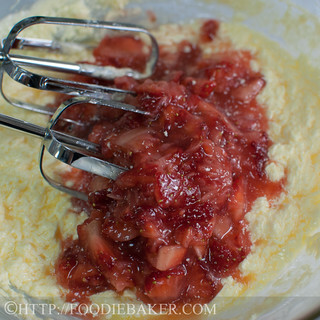 Add in the mashed strawberries and beat on low speed to incorporate them. Drizzle in the milk slowly, beating well on low speed. Sift in the flour mixture in two parts and fold it in gently. Add in red food colouring if desired. Divide the cake batter (1/4-cup batter per cupcake) and bake the cupcakes for 12-15 minutes, until a skewer inserted into the center of the cake comes out clean. Let the cupcakes cool on a wire rack completely before frosting. Whisk the flour and milk together in a small pot. 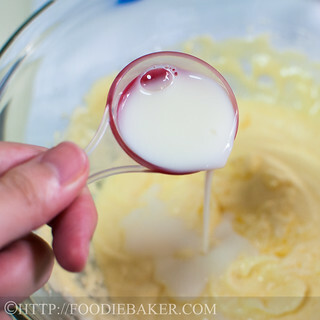 Heat the milk mixture over medium heat and whisk consistently until it has thickened into a glue-like consistency. Remove from heat and let cool completely. To speed up the process, place the pot over a ice water bath to let it cool faster. In a mixing bowl, combine the butter and superfine sugar. Beat with an electric mixer until light and fluffy. Add in the cooled milk mixture and the dried strawberry powder. Beat with the electric mixer until thoroughly combined. Use as desired. See the step-by-step photos on how to make the frosting here. Place the cream cheese and the unsalted butter in a large bowl. 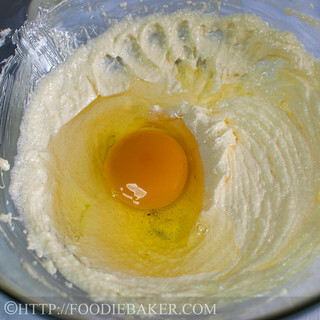 Using an electric mixer, beat the cream cheese and butter until creamy, for 1 minute. Add in 125 grams of icing sugar (1 cup) and beat until fully incorporated. Add in the mashed and drained strawberries and lemon juice and beat on low speed to incorporate. Beat in the remaining icing sugar until you've obtained your desired sweetness and consistency. Do not puree the strawberries. This will yield too much liquid and the batter will be too watery. If doubling or increasing the recipe, add in the eggs one by one, beating well after each addition. 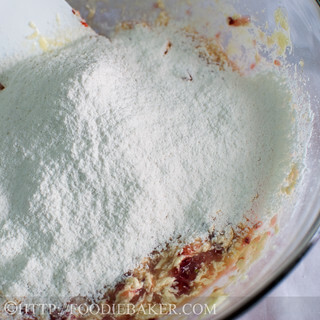 If doubling or increasing the recipe, add in the flour mixture in 3 parts, alternating with the milk in 2 parts. This is to prevent getting a grainy batter. The top of the cake will brown if you bake for too long, so start testing the cupcake after 12 minutes in the oven. If it’s still not done after 15 minutes, tent the top with aluminum foil to prevent the top from getting too brown. Alternatively, add more red food colouring in the batter the next time. Superfine sugar is not confectioner’s / icing sugar. To make superfine sugar – measure 75 grams of caster / granulated sugar in a food processor. Process until the sugar is powdery. So far I’ve not seen dried strawberry powder being sold here in Singapore, but I’ve found a recipe that looks really great here. Do not use strawberry puree. Strawberry puree contains too much liquid, and you’ll have a hard time getting the frosting right – you’ll probably end up using way too much icing sugar. Drain the strawberries after mashing them to get rid of the excess liquid. This is a sweeter frosting than Frosting 1, so if you like a not-so-sweet frosting, do try out the recipe above. 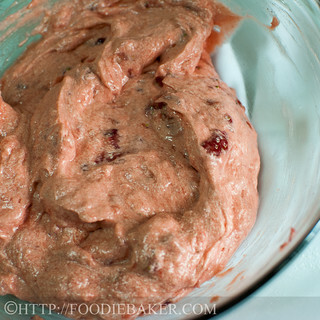 You can also use a combination of mashed strawberries and dried strawberry powder for this frosting. A quick question …I only ended up with 6 cupcakestead of 12 …they are sitting in the oven as we “speak” ;-D … Am I doing anything wrong? ?I followed yr recipe to a T ! Hi Spidermanbaby! Oh dear, my mkstake!! I used smaller cupcake liners hence I got 12 cupcakes. If using the standard cupcake size (1/4-cup batter per cupcake), it will only yield 6 cupcakes. I’m so sorry for my mistake, will correct the recipe! Nothing beats the real stuff! Hi Jasline, strawberry indulgence indeed! I’ve never seen strawberry powder before, would be great if we could getr it here. I love strawberries. I can imagine these tasting great esp when you are using real strawberries and freeze dried powder for the frosting.. Wonder if you can find the freeze dried powders in Sg? I have not seen it around. Perfect – thanks for the link. I think it would work well with raspberries too. Thank you! I really love the store, I wanted to buy so many things back (especially the flours) but unfortunately my luggage doesn’t have the space! Hi Jasline, wow, lovely looking! Thanks for sharing the baking store in Taipei, it helps as I might be visiting Taipei later in the year. Hope you have a great time in Taiwan. These cupcakes are such a beautiful colour and I am very intrigued by the strawberry powder. Not sure if we can get it here though. These are very beautiful and delicious looking cupcakes! You are so right about strawberry cake recipes. Hard to find one that uses real strawberries. The color of the cake along wth the frosting looks so pretty! Thank you for linking this week! hi jasline, i can imagine how ‘ strawberry’ these real strawberry cupcakes are! They are lovely ! want to say a big thank you for baking along with us all these while, you hv given us a lot of support and always appreciate your sharing , thank you! Cheers! So lovely, pink, and strawberry! These look fantastic, Jasline, and once again your photography is exceptional. There’s something really special about a berry-topped cupcake and you really captured it here. Hi Emily! Glad you like it! 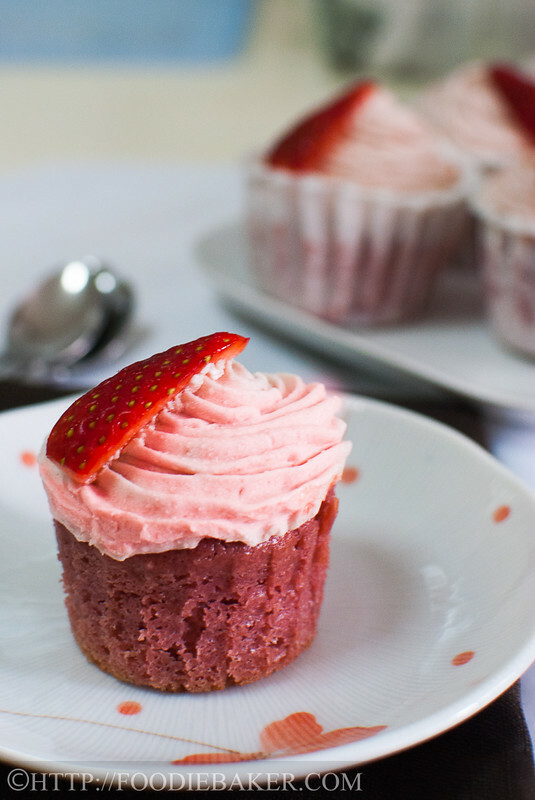 These look really pretty, love the use of strawberries in cupcakes! Oh my! this is a wonderful recipe for strawberries! Thanks for sharing! Hope you’ll like it Johnny! 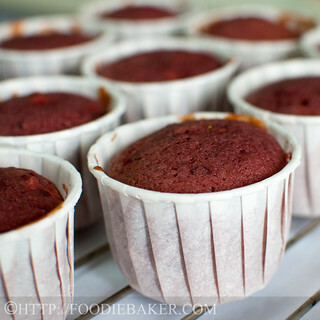 I used those muffin cups that can stand on its own without a muffin tin, so maybe you can look for them! But I’m sure it’ll taste great as a whole cake! Hello! I use a hand-held mixer and unsalted butter, found in the dairy section in the supermarket. Hand-held mixer and kitchenaid are relatively similar, just that you don’t have to hold the kitchenaid and there are more speed options for kitchenaid. The butter must be at room temperature – I will cut the butter into pieces, let it rest on the tablecounter for 30 minutes before beating it with the sugar. I usually beat for about 3 minutes on medium speed, scrape down the sides, then beat for another 2 minutes on high speed. If using a kitchenaid, I reckon a medium-high speed for 3-5 minutes will suffice for this small amount of butter in the recipe. I will beat longer if I’m baking a bigger batch of cupcakes (i.e., more butter and sugar are used in the recipe). The key is to see that the butter-sugar mixture has turned pale in colour and when you scrape the mixture, it is light and not heavy. Hi how long do you beat the sugar n butter till they become so light b fluffy ? I am using kitchen aid, pretty new to baking . What kind of butter are you using ? This is the way strawberry cake should be made. None of that strawberry jello, the real deal is the only way to make them. They look moist and delicious and I can just imagine the intense strawberry flavor. Delicious! 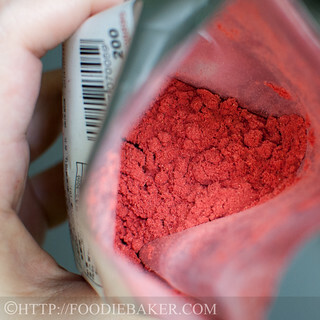 I have never seen the dried strawberry powder before and wanted to make a strawberry buttercream, I have to find it!! WOW! Lovely cupcakes! Looks so good with the strawberries! I can imagine the full strawberry yumminess in each bite, especially if the strawberries are the tangy ones! I have not seen strawberry powder selling over here before, must keep a lookout for them! Thank you for linking! Have a great weekend!